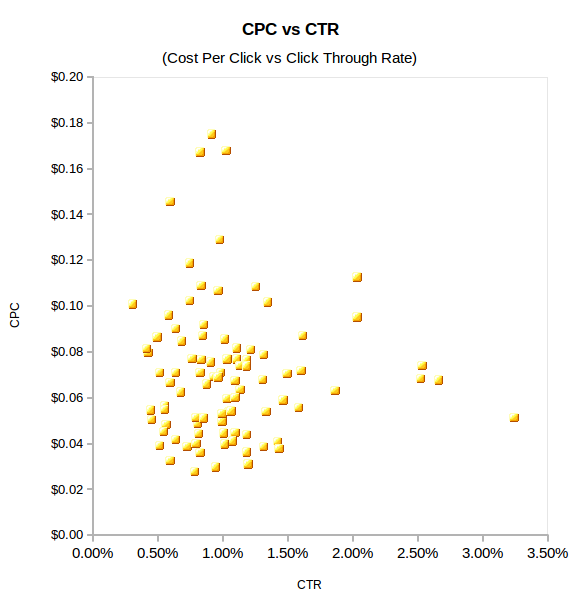 Does having a low or high click through rate (CTR) affect your cost per click (CPR) with your mobile ad network? I plotted the past 90 days worth of AdMob data. The answer: Nope. It doesn’t. Don’t worry about it. Just be polite to AdMob and your users’ data plans! Don’t saturate them with requests if your users won’t get a chance to see it. As an example, if takes two minutes to play your game, don’t request an ad every 12 seconds! As an aside, that means treat your users (AKA the product) with some respect. Don’t ad bomb them on your main content or game screen page. If they like what you’ve done and you’ve supplied decent and appropriate keywords, they’ll get to it during the intermission.